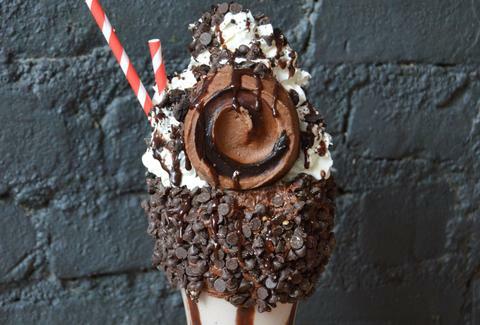 Black Tap, the burger joint known for its over-the-top milkshakes (loaded with everything from candy to an actual full piece of cake) is releasing a new milkshake in partnership with its SoHo neighbor, Little Cupcake Bake Shop, and you can expect your Instagram feed to be flooded with it for the next week. The Brooklyn Blackout Shake is named after LCBS’s Brooklyn Blackout Cake, aka Food & Wine’s pick for best chocolate cake in the U.S. It's a chocolate shake featuring a chocolate frosted chocolate chip rim, whipped cream, and chocolate syrup, all topped off with LCBS's Brooklyn Blackout Cupcake. If you can manage to somehow get it in your mouth, this baby is probably worth the wait. Watch the shake get made live in the video below.